Monday, Nov. 12, 2007–7:30 AM in the gym for warmups. The choir will sing at 8:00 AM after the veterans are seated and the national anthem is played. Where Did You Hear a Cole Porter Song? It's been fun to hear the reactions of students, parents, and visitors to the WLA choirs' Fall Concert this past Sunday. Some of the comments have been congratulatory ("A very nice concert!") and some have been eye-opening ("I knew every one of those songs!" "Finally, a concert of music for us old folks!"). Thank you to everyone who came and to all the students who sang so well! One of the reasons I chose the music of Cole Porter was because I wanted the students to be able to identify his music in the soundtracks of the TV shows and the movies they they watch. While we were learning the Cole Porter medley, students kept telling me about the scene in the movie The Parent Trap when "Everytime We Say Goodbye" (Wikipedia) is played. Now that the concert is over, students keep telling me when and where they heard a Cole Porter tune. Two I heard today were in a Friends episode ("Night and Day") and in the movie What Women Want ("I've Got you Under My Skin"). WHERE HAVE YOU HEARD COLE PORTER'S MUSIC? Please leave a comment and let me know–I'd love to hear from you! Why do we stand in church? Nehemiah 8:5 "Ezra opened the book. All the people could see him because he was standing above them; and as he opened it, the people all stood up." The date was October 8, 445 BC (the 1st day of the 7th month of the Jewish calendar). Under the prophet (and scribe) Ezra, a second wave of Israelites was returning from exile in Babylon. They had been released from exile by the Persian King, Cyrus the Great, in March 538 BC, after they had been taken into exile by the Neo-Babylonian/Chaldean King Nebuchadnezzar after he had destroyed Jerusalem in 586 BC. Ezra was reading from the Book of the Law that Hilkiah the high priest found in the temple during the reign of King Josiah (640-609 BC). The occasion was the New Year's Day of the civil calendar, celebrated as the Feast of Trumpets, with cessation of labor and a sacred assembly. A lot of what we do in worship has its origin in events from the Bible. When we sing the Glory to God we remember the angels who sang at Jesus' birth. When we sing Psalms we are using the same "hymnal" as people did during Old Testament times. When we confess our sins, we are doing what it says we should do throughout the Bible. AK has worked so hard since the beginning of the school year to prepare for the Fall Concert. The High School Musical medley is 9 minutes and 30 seconds long and is fully choreographed by Hannah Sugars. We had to postpone our regular Wednesday rehearsal this week because of the WLA vs. St. Mary's Springs football game at Fruth Field (we won 28-14! ), so we rehearsed tonight, Thursday, Oct 18. We finally had the stage set in the choir room, the guys had their rip away warm-up sweats, and the girls had their spin out skirts. Then it was 10 minutes to go and i was ready to let them go for the night and they begged me to do it again! I love these kids! You are all invited to come to Winnebago Lutheran Academy (map) on Sunday, Oct. 21 at 7:00 PM for the first choir concert of the school year–Classic Cole Porter. 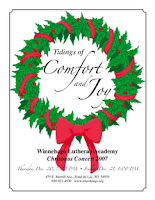 (Click for PDF file of the program) The concert will feature WLA's four choirs (Traveling, Viking, Freshman, and Academy Kids) singing the music of famed composer/lyricist Cole Porter with the Academy Kids providing entertainment for the younger crowd with a medley of music from High School Musical! Choir students are asked to be in the choir room at 6:00 PM for warmups. Hope to see you there! This is the whole High School Musical medley. We have one more rehearsal, Thursday night, before the Fall Concert (Sun., Oct 21, 2007 , 7 PM, WLA gym) We're performing for a former AKer, Jenny Meyer, who popped in tonight and surprised us with cookies and soda! We love it when veterans come back and visit–especially when they bring treats! So I preach, "Guys! Protect your ladies! If they are going to fall, throw yourselves under them so they never hit the ground!" Way to go Nikki, Hannah, Josh & Josh!!! 65 besides their 7,337 menservants and maidservants; and they also had 200 men and women singers...70 The priests, the Levites, the singers, the gatekeepers and the temple servants settled in their own towns, along with some of the other people, and the rest of the Israelites settled in their towns. The Levites were the one tribe of the Children of Israel who did not receive a portion of land as their inheritance. Instead, their inheritance was service to the LORD as priests and musicians in the tabernacle and temple. But they did need a place to live–the tabernacle and temple didn't have enough rooms for the 23,000 Levites! So the LORD commanded Moses to give the Levites towns and pastureland from the inheritance Israel would possess, and Joshua carried out this promise after the conquest of the land of Canaan. Kind of a strange passage about singing, isn't it? At first glance it doesn't seem to tell us much, but when you read it in context, it becomes a passage full of hope and God's grace. The remnant was taken to Babylon as servants and his sons until the kingdom of Persia came to power–about 49 years later. In the first year that Cyrus the Great, King of Persia, reigned over Babylon (he captured it in Oct. 539 BC), the LORD (Yahweh, the God of the Promise) moved the heart of Cyrus to rebuild the temple and let the Children of Israel return to their homeland (March 538 BC). What follows in Ezra 2 is the list of exiles who returned. Out of the 42,360 exiles who returned to Jerusalem, 128 of them were male descendants of Asaph–a musician, the chief minister before the ark of the LORD, a cymbal player, a seer, a recorder for King Hezekiah, the keeper of the king's forest, and the author of Psalm 50 and Psalms 73-83 . This gives comfort and hope. The singing hadn't stopped when they were in exile, even though it was hard to sing praise to God when the Babylonians forced them to sing, as Psalm 137 records. There were many male descendants of Asaph after 49 years, showing that God still blessed the remnant, even in exile. The singing would continue–God brought the leaders of singing back to the rebuilding of his temple. 8:00-8:45 AM Warmups in front of church. Sing through all five pieces. 27 Hezekiah gave the order to sacrifice the burnt offering on the altar. As the offering began, singing to the LORD began also, accompanied by trumpets and the instruments of David king of Israel. 28 The whole assembly bowed in worship, while the singers sang and the trumpeters played. All this continued until the sacrifice of the burnt offering was completed. 18 Then Jehoiada placed the oversight of the temple of the LORD in the hands of the priests, who were Levites, to whom David had made assignments in the temple, to present the burnt offerings of the LORD as written in the Law of Moses, with rejoicing and singing, as David had ordered. 13 She looked, and there was the king, standing by his pillar at the entrance. The officers and the trumpeters were beside the king, and all the people of the land were rejoicing and blowing trumpets, and singers with musical instruments were leading the praises. Then Athaliah tore her robes and shouted, "Treason! Treason!" This section of God's Word reads like a soap opera. To get a little background to today's verse, go back a chapter and read 2 Chron. 22:10-12. 10 When Athaliah the mother of Ahaziah saw that her son was dead, she proceeded to destroy the whole royal family of the house of Judah. 11 But Jehosheba, the daughter of King Jehoram, took Joash son of Ahaziah and stole him away from among the royal princes who were about to be murdered and put him and his nurse in a bedroom. Because Jehosheba, the daughter of King Jehoram and wife of the priest Jehoiada, was Ahaziah's sister, she hid the child from Athaliah so she could not kill him. 12 He remained hidden with them at the temple of God for six years while Athaliah ruled the land.